I am on defence because sometimes people can tell you to do bad things and you have the right to make your own choice. No! Because if you do what you like like stealing that would be theft. I disagree because if you liked to hurt somone everytime it wont be nice for the person your hurting. I think it depends if its a trusted adult you should do it if its a stranger don’t do it if your alone you can do what you like. I think it depends on what you are doing. I disagree because it would be wrong hurting somebody also if it is a nice thing than do it!. where doing again or you do what you like you have not helped your self. weather your right or wrong. I think that it is according to what we would do if we were allowed to do what we want but if it is something bad I think no. I think that if you do the right thing you will be fine. I agree cause if someone tells you to put your head in the bin will you do it? I disagree because if you do what you like there would be no law and shops would get robbed.The world will be a bad place, just like the people who stole the iPads, they did what they liked. This was very bad. Skye from Aquamarine. We disagree because people like our Parents tell us what to what to do for our own benefit. If we were allowed to do anything we wanted the world would be full of people breaking the laws, hurting each other and most importantly vandalising mother nature. 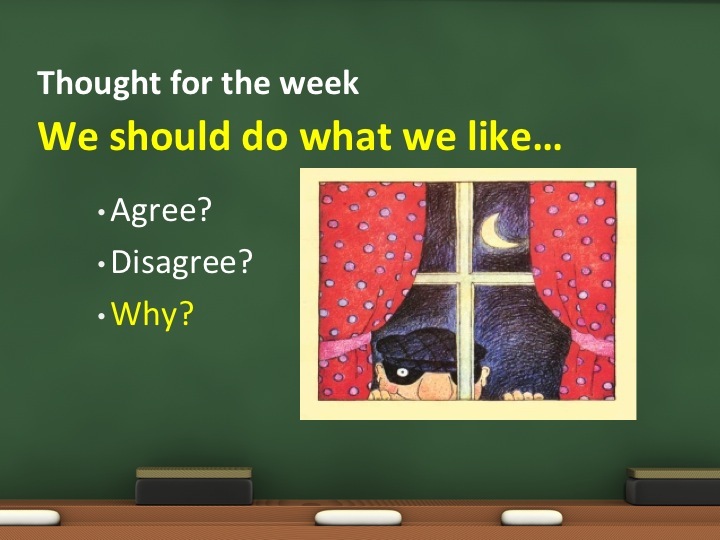 This is why we disagree with this thought of the week. One more thing, if you do something do it right and if you are doing something bad don’t do it at all. I agree with you Amy.C because if you get in trouble all the time you will get boring teachers or adults saying stop hurting pepol. If it’s in school you will be having detention every day and you won’t like it. I think that is a bad idea because people can get very injured , also thay can be stealing lots of precious stuff. I agree with you Amy.c but I also think that If a person wants to do the right thing then he/she has all rights to do it. I disagree because you can get hurt or even go to jail. I disagree because there are consequences to everything we do. If everyone did what they wanted the world would be a mess. And we all would end up getting hurt. I disagree because if you do what you like it could hurt another person’s feelings or you could hurt yourself. I disagree, because if we donot listen to our elders and do whatever we like to do then we might get in trouble.